If you’ve ever been to the beach when the baby blue crabs are in season, you’ll know it. These small, larval, versions of the yummy entrees look like rain droplets. They are small but mighty and can become quite a nuisance as they look for any surface to grab ahold of, including inside your bathing suit, which can elicit a few yelps. That’s because blue crabs are looking for something solid to grab onto and settle on the bottom. Bathing suits are far from the ideal home, which is typically seagrass and oyster reef. Biologists at The University of Texas Marine Science Institute used the blue crab’s affinity for grabbing onto anything to create special collectors in the ocean and throughout local bays to determine how many baby crabs migrate back into the estuaries to grow up, how far they can travel, and when they are likely to do so. Texas blue crab populations have been declining since 1987, and this is likely due to a number of factors such as reduced fresh water in estuaries, habitat loss, fish predation, and larval recruitment. They have a complex lifecycle and very little is known about how they recruit as larvae from the ocean back into the estuaries. As crabs reach adulthood, the females laden with thousands of eggs under their abdomens go out to the Gulf of Mexico where the eggs hatch into larvae. These larvae grow and disperse with the currents, but eventually need to find the passes back into the estuary where they will become juvenile crabs and start the next generation as adults. Biologists Tracy Weatherall, Lindsay Scheef and Ed Buskey recently published a study in Estuarine, Coastal and Shelf Science that describes the ambitious project to determine how many baby crabs recruit back into the bays and the specifics of that recruitment. They found that less than 1% of the larval blue crabs in the ocean make it back into the bays. In addition, seasonal patterns of recruitment were found with the familiar commercial blue crab species, Callinectes sapidus, peaking in the fall and another common species known as the lesser blue crab, Callinectes similis, peaking in the winter. 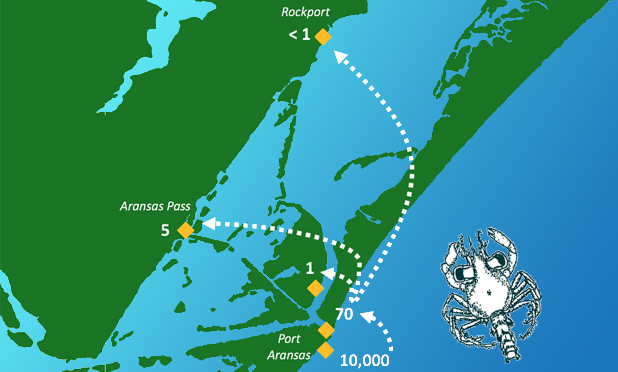 The scientists set up six collection stations in the ocean just off Port Aransas and throughout Aransas Bay. The collectors, referred to as Hog Hair Collectors, are actually made with air conditioning filters rather than hog hair, but are given the moniker due to the thousands of “hairs” that afford many spots for a crab to grab ahold of as they float by on the tides and currents. The collectors were checked daily, which required a very large effort. “We could not have done this study without the tremendous help of citizen science volunteers,” said author Dr. Ed Buskey. The biologists relied upon an army of citizen science volunteers to collect and process hundreds of samples. Over 60 citizen scientists volunteered over 2,000 hours of service. “This is the most comprehensive study of recruitment of blue crab larvae to Texas estuaries carried out to date and gives a great baseline to begin to understand the link between larval recruitment and cohorts of juvenile and adult blue crabs in the Mission-Aransas estuary,” concluded Buskey. 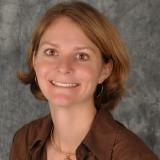 This research was supported by the National Oceanic and Atmospheric Administration and the Texas State Aquarium. The manuscript authors would especially like to acknowledge Francie Henderson, Chris Muckey and all of the citizen science volunteers for their hard work and dedication throughout the project.